It is already thought that consumption of omega-3 fatty acids can help decrease the risk of coronary heart disease, but there may be anti-cancer benefits as well. By now the health benefits of consuming foods and supplements containing omega-3 polyunsaturated fatty acids (PUFAs) are known. Recent research, however, demonstrates that not all PUFAs function the same way. Three types of omega-3 fatty acids are involved in human physiology: α-linolenic acid (ALA), eicosapentaenoic acid (EPA), and docosahexaenoic acid (DHA). ALA, derived from plants, is found in walnuts and other nuts, flaxseed and other edible seeds, and in oils (eg, canola, soy, hemp). EPA and DHA are marine-based and sourced from salmon, tuna, trout, and other fatty fish, as well as phytoplankton and algae. 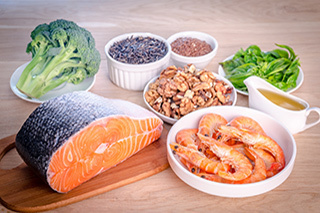 In a recent study, David Ma, PhD, and colleagues in the Department of Human Health and Nutritional Sciences at the University of Guelph, Canada, found that eating a diet rich in omega-3 fatty acids has a significant inhibitory effect on breast cancer. “There is certainly evidence that plant based omega-3s are beneficial for cancer prevention and treatment. Similarly, there is evidence for fish oil as well. One of the goals of our study was to define what the relative difference is,” explained Dr Ma. This is the first study to compare the potential of plant-based vs marine-based omega-3 fatty acids in inhibiting the development of mammary tumors. Its significance lies in that plants are the primary source of omega-3 fatty acids in the Western diet. Dr Ma’s team worked with mice used in studies on prevention and treatment of HER-2 positive breast cancer. HER-2 positive cancer, which occurs in 25% to 30% of breast cancer cases, is highly aggressive and has a poor prognosis. The Guelph group compared the effects of diets containing the different types of omega-3s on this type of cancer. Their findings showed that marine-based fatty acids are more effective at inhibiting tumor development and growth than are plant-based ALA (D Ma, oral communication, January 2018).